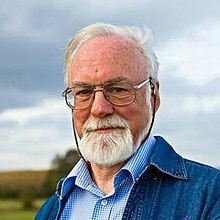 John McCabe, CBE (21 April 1939 – 13 February 2015) was a British composer and pianist. He created works in many different forms, including symphonies, ballets, and solo works for the piano. He served as principal of the London College of Music from 1983 to 1990. Guy Rickards described him as "one of Britain's finest composers in the past half-century" and "a pianist of formidable gifts and wide-ranging sympathies" (Rickards 2015). McCabe was born in Huyton, Liverpool on 21 April 1939 (Rickards 2001; Rickards 2015; Davis 2015). His father was a physicist (Anon. 2015b). McCabe was badly burned in an accident when he was a child and was home schooled for eight years (Anon. 2015a). During this time, McCabe said that there was "a lot of music in the house", which inspired his future career (Coghlan 2014). He explained "My mother was a very good amateur violinist and there were records and printed music everywhere. I thought that if all these guys – Beethoven, Brahms, Schubert – can do it, then so can I!" (Coghlan 2014). By the age of 11 McCabe had composed 13 symphonies, but he later suppressed them, believing they were not good enough (Rickards 2001; Coghlan 2014). He subsequently attended Liverpool Institute (Anon. 2015b). After studies at the Royal Manchester College of Music (now the Royal Northern) and in Munich, with composers Humphrey Proctor-Gregg, Thomas Pitfield, Harald Genzmer and others (Rickards 2001; Rickards 2015; Anon. 2015), he embarked upon a career as both a composer and a virtuoso pianist (Rickards 2001; Davis 2015). Guy Rickards considers McCabe's early works to have been overlooked because he was perceived as a pianist rather than a composer (Rickards 2015). One of his early successes was the orchestral song cycle Notturni ed Alba (1970), based on a set of poems in medieval Latin about the theme of night (Rickards 2015; Anon. 2015a), which was described in Gramophone as "an intoxicating creation, full of tingling atmosphere and slumbering passion" (quoted in Anon. 2015a}}). His Concerto for Orchestra (1982) brought him international recognition (Anon. 2015b), but it was not until the 1990s that he came to be viewed primarily as a composer, with the successes of the piano work Tenebrae (1992–93), which marked the deaths in 1992 of musicians Sir Charles Groves, William Mathias and Stephen Oliver, and was written for Barry Douglas; his Fourth Symphony, Of Time and the River (1993–94); and his third ballet Edward II (1995) (Rickards 2015), which won the 1998 Barclays Theatre Award (Anon. 2015a). He worked in almost every genre, though large-scale forms lie at the heart of his catalogue with seven symphonies, two dozen concertante works and eight ballet scores to his name (Anon. 2014). His numerous concerti include four for his own instrument, the piano (1966–76), three for one or two violins (1959, 1980, 2003) as well as for viola (1962), harpsichord (1968), oboe d'amore (1972), clarinet (1977), orchestra (1982), trumpet (1987) and flute (1990), and double concertos for viola and cello (1965) and clarinet and oboe (1988). His chamber works include seven string quartets, the third of which (1979) was inspired by the landscape of the Lake District (Anon. 2015b). His solo instrumental music was mainly written for the piano; he composed 13 studies for the instrument, including Gaudí (1970), inspired by the architect; Mosaic (1980), inspired by Islamic art; and a series of seven (2000–9) each explicitly drawing inspiration from a different composer (Rickards 2015; Anon. 2015b}. Other significant piano works include the Haydn Variations (1983), written to commemorate the 250th anniversary of Haydn's birth (Rickards 2001; Rickards 2015; Anon. 2015a). McCabe's style evolved gradually from an initial lyrical constructivism through a serialist phase, with a fascination with repetitive patterns leading to a more complex combination of processes to achieve more subtle forms of continuity (Maycock 1989, 386). Rickards states that his influences included Vaughan Williams, Britten, Tippett and Karl Amadeus Hartmann (Rickards 2015), and he was also influenced by non-classical music including rock and jazz (Anon. 2015b). He had a long-lasting association with the Presteigne Festival (Beale 2010). McCabe first became known as a pianist. His repertoire was wide, from pre-classical to modern composers (Rickards 2015). He specialised in twentieth-century music, particularly by English composers. He gave the UK premiere of John Corigliano's Piano Concerto (Rickards 2015). Another specialism was the music of Haydn; McCabe's "definitive" (Anon. 2015a) mid-1970s recording of Haydn's complete piano sonatas was described in Gramophone as "one of the great recorded monuments of the keyboard repertoire" (quoted in Rickards 2015). He recorded several CDs with the cellist Julian Lloyd Webber (Rickards 2015). From 1965 to 1968 McCabe was pianist‐in‐residence at University College, Cardiff (Kennedy 2006). He served as principal of the London College of Music from 1983 to 1990, where his efforts to enhance the college's profile resulted in its merging with Thames Valley University (Rickards 2015; London College of Music 2017. He also held visiting professorships at the universities of Melbourne, Australia and Cincinnati, USA during the 1990s (Rickards 2015). Among his notable pupils is Canadian composer Gary Kulesha (Horgan and Ware 2008). McCabe wrote guides to the music of Haydn, Bartók and Rachmaninoff, and a book on contemporary English composer Alan Rawsthorne (Rickards 2015). McCabe was appointed a Commander of the Order of the British Empire (CBE) in 1985 for his services to music (Anon. 2014; Rickards 2001; Anon. 2014) He was awarded an honorary doctorate by the University of Liverpool (Anon. 2015a). In 2014, McCabe won the Classical Music Award at the 59th Ivor Novello Awards (Davidson 2014). He married Monica Smith, a former head of the Sittingbourne Music Society, in 1974 (Robinson 2013; Anon. 2015b). In December 2012 McCabe was diagnosed with a brain tumour. He continued to compose music during his treatment (Robinson 2013; McCabe 2013, passim). John McCabe died after a long illness on 13 February 2015 (Anon. 2015a). 1974–76 – recorded the complete Piano Sonatas of Haydn (reissued later on CD) for Decca/London. 1984 – Rainforest I commissioned by the Chamber Music Society of Lincoln Center, New York. 1985 – awarded CBE for services to music. 1995 – premiere of Edward II with Stuttgart Ballet, choreographed by David Bintley. 2003 – Les martinets noirs commissioned by Amsterdam Sinfonietta. 2004 – received Distinguished Musician Award from the Incorporated Society of Musicians. Anon. 2014. John McCabe. Music Sales Classical: Part of Music Sales Group website (accessed 18 August 2014). Anon. 2015a. "Composer and Pianist John McCabe Dies Aged 75" BBC News (13 February; accessed 20 January 2019). Anon. 2015b. "John McCabe, Composer: Obituary". The Telegraph (20 January; accessed 20 January 2019). Beale, Catherine. 2010. A Festival History Presteigne Festival website (accessed 20 January 2019). Coghlan, Alexandre. 2014. "Interview: John McCabe". M Magazine (5 June; accessed 19 January 2019). Craggs, Stewart R. 1991. John McCabe: A Bio-Bibliography. Bio-Bibliographies in Music, no. 32. Westport: Greenwood Press. ISBN 0-313-26445-7. Davidson, Amy. 2014. "The Ivor Novello Awards 2014: Winners in Full" DigitalSpy (22 May; accessed 20 January 2019). [Davis, Elizabeth]. 2015. “John McCabe, Pianist and Composer Dies Aged 75”. Classic FM. (13 February; accessed 19 January 2019). Foreman, Ronald Lewis Edmund (ed.). 1975. British Music Now: A Guide to the Work of Younger Composers. London: Elek. Horgan, Alan, and Evan Ware. 2008. "Gary Kulesha". The Canadian Encyclopedia (accessed 19 January 2019). Kennedy, Michael. 2006. The Oxford Dictionary of Music, second edition, revised. Oxford and New York: Oxford University Press. ISBN 0-19-861459-4. Larner, Gerald. 1969. "The Lion, the Witch and the Wardrobe". The Musical Times 110, no. 1514 (April): 372. London College of Music. 2017. LCM History. University of West London website (accessed 19 January 2019). McCabe, Monica. 2013. "Composing in Adversity". Musical Opinion 136, no. 1496 (September–October): 12–13. Reprinted, as "Composer in Adversity", on the composer’s website (accessed 19 January 2016). Matthew-Walker, Robert. 1999. "John McCabe at 60". Musical Opinion 122, no. 1417 (Spring): 138–39. Maycock, Robert. 1989. "Variations on a Form: John McCabe's String Quartets". The Musical Times 130, no. 1757 (July): 386–88. Odam, George (ed.). 2008. Landscapes of the Mind: The Music of John McCabe, with a foreword by Vernon Handley. Guildhall School of Music & Drama Research Studies, no. 6. London: Guildhall School of Music and Drama. ISBN 978-0-7546-5816-0. Rickards, Guy. 1999. "The Piano and John McCabe". British Music: The Journal of the British Music Society 21:35–47. Rickards, Guy. 2001. "McCabe, John". The New Grove Dictionary of Music and Musicians, second edition, edited by Stanley Sadie and John Tyrrell. London: Macmillan Publishers. Rickards, Guy. 2015. "Composer John McCabe Has Died". Gramophone (13 February). Robinson, Hayley. 2013. "Poorly Composer John McCabe's Delight as His Music Features at Proms" KentOnline website (2 August; accessed 20 January 2019).